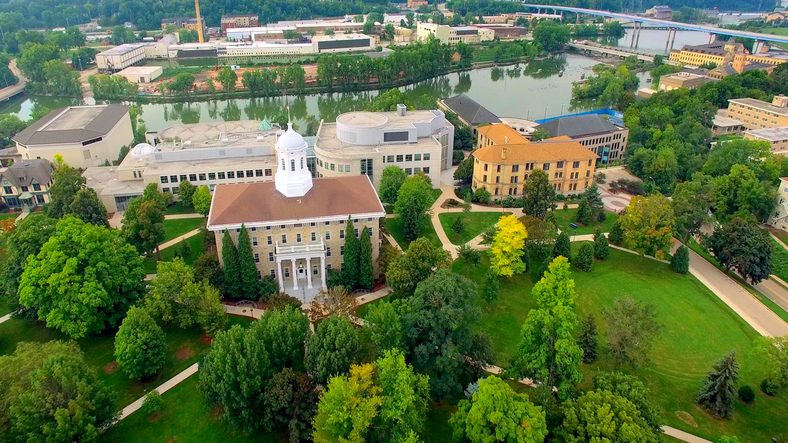 Aerial View of Beautiful College Campus, Lawrence University in Appleton Wisconsin. Looking into the quality of schools in Ashland, WI is a must if you’re moving to the area with your growing children. Public schools in Ashland are administered by the Ashland School District, which currently enrolls more than 2,000 students. Marengo Valley Elementary School is located in northern Wisconsin, about ten miles south of Ashland. The school is surrounded by picturesque countryside scenery, with lush woodlands on three sides. Marengo Valley Elementary School’s consistently updated curriculum is focused on the Common Core State Standards as well as the Wisconsin Academic Standards. The school has received the prestigious New Wisconsin Promise Award of Excellence for 12 years and running (the same amount of years since the award has been presented to schools). Marengo Valley Elementary School is also recognized as a National Blue Ribbon School. Lake Superior Primary School encompasses approximately 30 acres of beautiful northern Wisconsin, located a few minutes away from Lake Superior’s scenic south shore. The school is a SAGE (Student Achievement Guaranteed in Education) school, which allows it to maintain a class size to teacher ratio of 18 to 1. The school offers daily Kindergarten programming. Lake Superior Primary School employs a highly committed and competent faculty and staff who are all passionate about providing quality education to each student. Each member of the staff is dedicated to getting to know each student and their families, so they may be able to provide a quality educational experience. Lake Superior Elementary School is a community-centric school that boasts an inspiring, creative learning atmosphere. The school has received the School of Recognition Award multiple times, and has a highly qualified and dedicated staff of teachers, support, and custodial and maintenance staff. Lake Superior Elementary School works together with the Bad River Ojibwe Reservation in order for students to experience and learn more about Native American culture, celebrate diversity, and build a stronger connection between the two communities. Ashland Middle School’s philosophy and curriculum focuses on both the educational and developmental needs of middle school students, so they can experience a seamless transition between elementary and high school. The school serves students from grades six through eight, utilizing the House System. The system allows a core group of teachers to supervise in Core Academic Classes to students within a common group. This allows teachers and students to foster and develop a relationship with a collaborative approach, which results in a community of learners all working together in an educational environment that encourages a culture of creativity, discovery, teamwork, and compassion. In addition, the staff at Ashland Middle School works with enthusiasm and integrity to establish a trust between teacher and student.